Japan is not releasing any economic data today therefore GBPJPY will be only under the influence of economic reports in the UK such as Avg Earnings – ex bonus, Avg Earnings – incl bonus, Claimant Count Change (k), Claimant Count Rate (%) and ILO Unemployment Rate (3Mths). GBPJPY has been moving with bearish bias but it looks as if there is going to be a weak reversal soon. 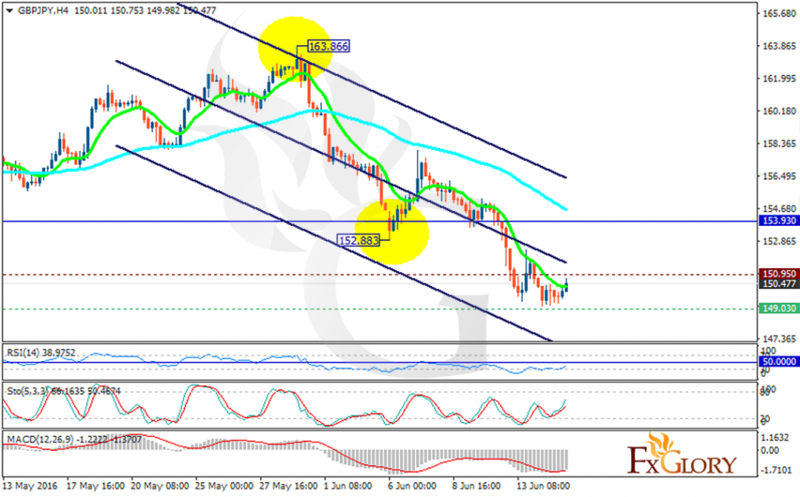 The support rests at 149.030 with resistance at 150.950 which both lines are below the weekly pivot point at 153.93. The EMA of 10 has already passed the EMA of 75 and is falling down the descendant channel as well. The RSI is getting close to the 50 level, the MACD indicator is in negative territory and the Stochastic is showing upward momentum. The resistance level breakout can push the price toward higher levels targeting 152.35 otherwise the pair will continue its downward trend targeting 148.00.